Excellent steam facility, unusual design, works well and easy to use. The rounded back panel might not suit all tastes. 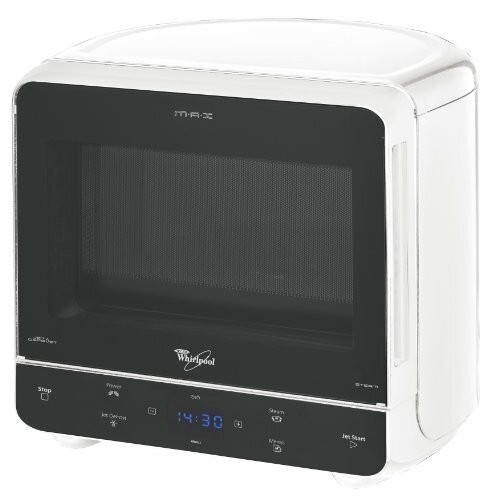 Need a reliable yet small corner microwave? This white solo microwave from Whirlpool should fit the bill, providing a 28cm turntable, 750w of power and overall capacity of 13 litres. The Max 35 range feature a curved back piece, which enables them to be placed deeper into a corner than a traditional square shaped microwave - thus meaning less wasted space, and more usable kitchen surface for you to use. The controls are located at the base of the door, to save further space - all are clearly marked, and operating the microwave was easy. The display is digital, and is both large enough to be read and light enough to be seen, even in bright environments. A welcome addition is the steam mode, which allows you to steam rather than microwave food, for a healthy alternative. The exterior is finished in white, which wipes clean pretty easily, and so should be practical in the long run. Overall build quality, as you'd expect from Whirlpool, is good - the appliance feels solid to the touch, and as though it will last a long time. In summary, the white Whirlpool Max 35 is a well designed microwave, offering a slightly unusual design, good performance and should be pretty reliable too.